Going back at work after being a stay at home mom for the babies’ first year, one of the things I truly miss is the opportunity to do sensory, crafty activities. I’m all about being thrifty and using items that can be found in my own home (or no further than the dollar store) for the twins’ playtime opportunities. My nanny has picked up where I left off, but still, I miss being a part of it myself. 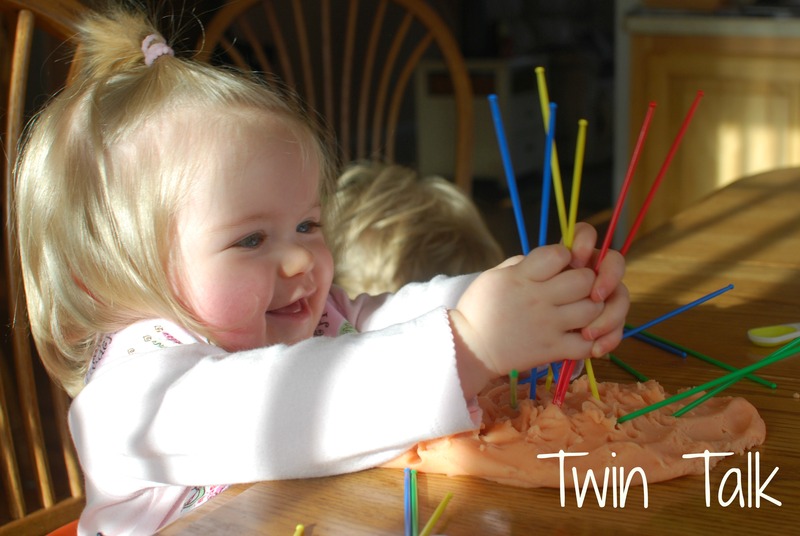 My new goal is to try a new sensory activity every weekend with the twins. It doesn’t have to be complicated. This weekend I suppose we did two: We walked in the woods and explored the autumn leaves, trees, and rocks, and today, we played with playdough. 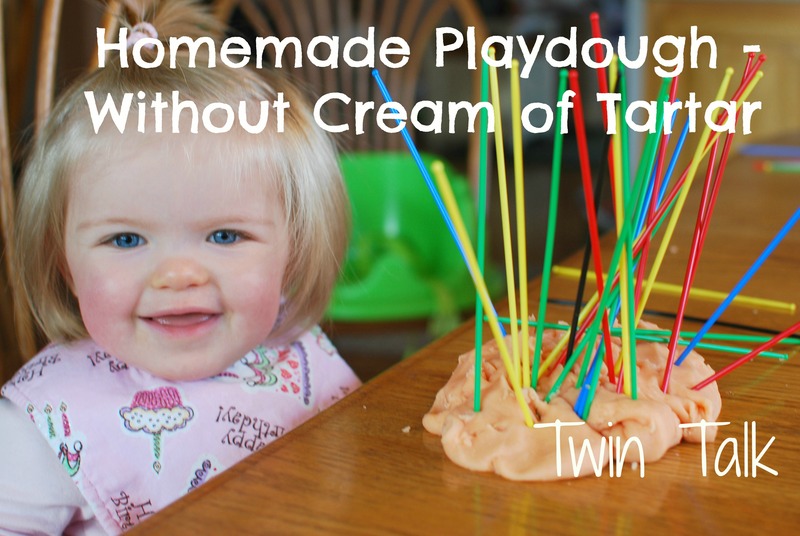 When I was a child, I loved playdough. I flattened it out into a pancake and stabbed it repeatedly with straws. I pushed it through the spaghetti maker and and balled it back up again. But I was also ten years old. 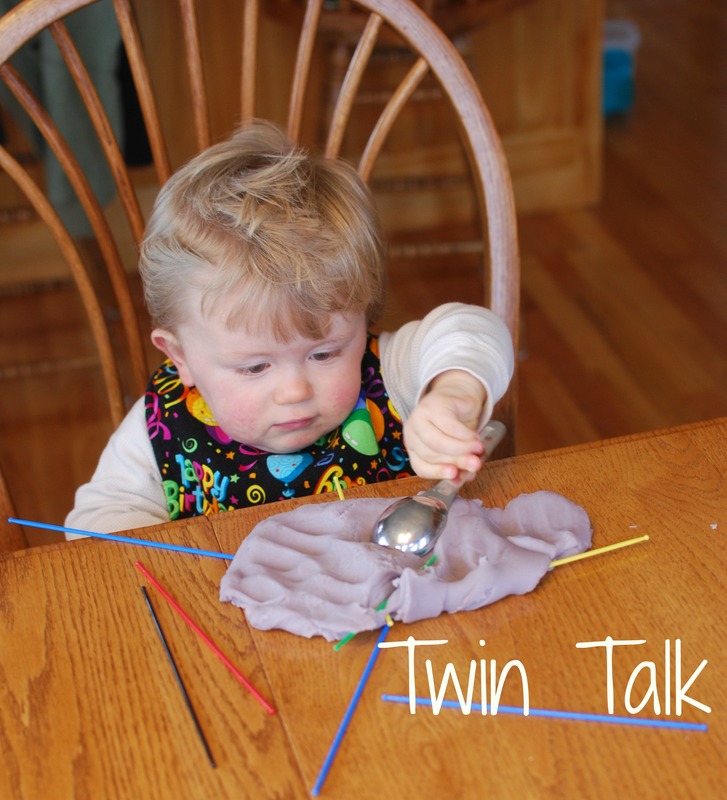 As it turns out, playdough is fun at any age and is fabulous for getting those creative juices flowing. 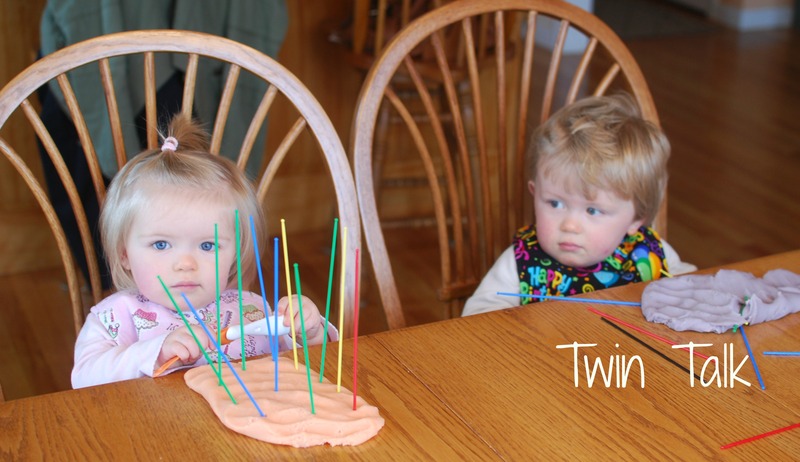 Because the twins are only 15 months, I was a little concerned about them sneaking a bite of the squishy stuff, so I decided to make my own. Though not a single bite was tried, I’m so glad I made my own because I know exactly what went into it, I got to choose my own colors (it’s the little things), and it took me less than 5 minutes to make. Oh, and it was FREE. I used this blog post as the basis for my recipe. Mix it all up in a pot, medium heat, stirring constantly. Take it off the heat when it hardens into a solid mass and let it cool. Then knead it for a minute or two and you’re good to go – ready for use! (I must say that for my second batch, I needed some extra flour on my plate as I kneaded the dough to get rid of the leftover stickies.) Here’s the finished product from my two batches. Depending on the age of the child, you’d want some materials they could use for play. 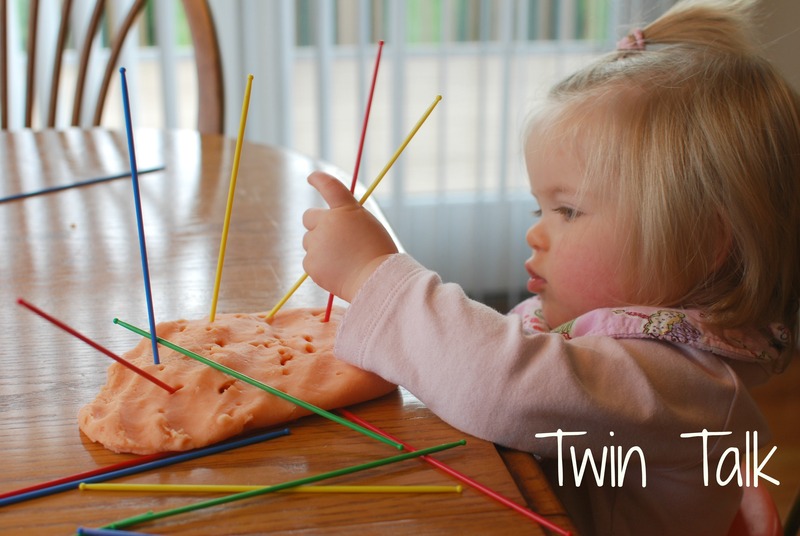 I knew my twins wouldn’t be able to make their dough into shapes or anything of that sort, so I bought $1 pick-up sticks at Target for poking. I also got out some measuring spoons. You could use anything – from pine cones and sticks to cookie cutters and plastic utensils. It’s a good thing I got the sticks, because they ended up being the real hit. Now, every kid is different, and as I expected, nothing ever goes as planned. C spent the first five minutes either in a panic over this mushy mass in front of her (“Don’t make me touch it! !”), or completely bored. B took off with it, poking it and exploring, though neither of them ever really got their hands into it. Then, after a few minutes, B got bored. He actually left the table. But C finally found some way to enjoy the dough sitting in front of her. She absolutely loved poking the dough with the sticks and then removing them. And then throwing them on the floor. And repeat. She sat at the table for no less than a half hour, just taking out sticks. It wasn’t exactly what I had in mind, but it was a successful activity. The best part about the playdough is that when stored in an air-tight container (or a ziplock bag), it’ll last for months. If you live in a humid area, you could put it in the fridge, but since we’re entering the beginning of a dry winter, I’m going to leave mine out and see what happens. 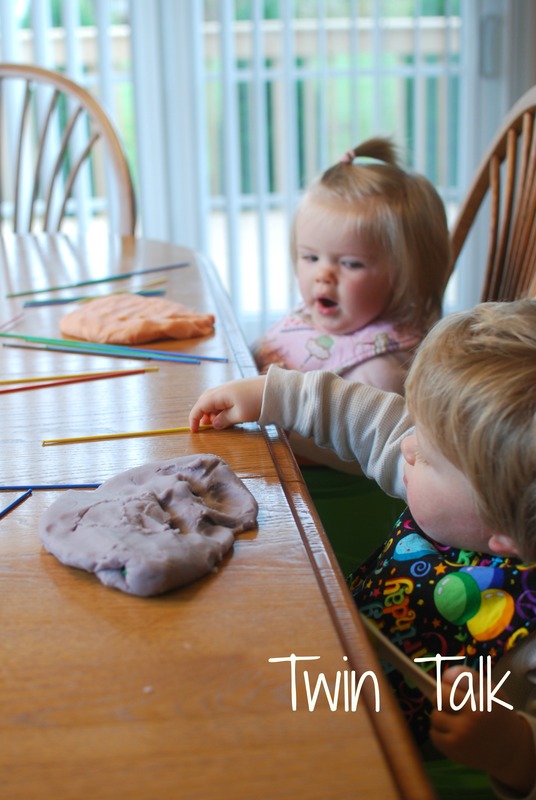 Today was the first time we had ever used playdough, so I’m excited to see what they’ll do with it next time! 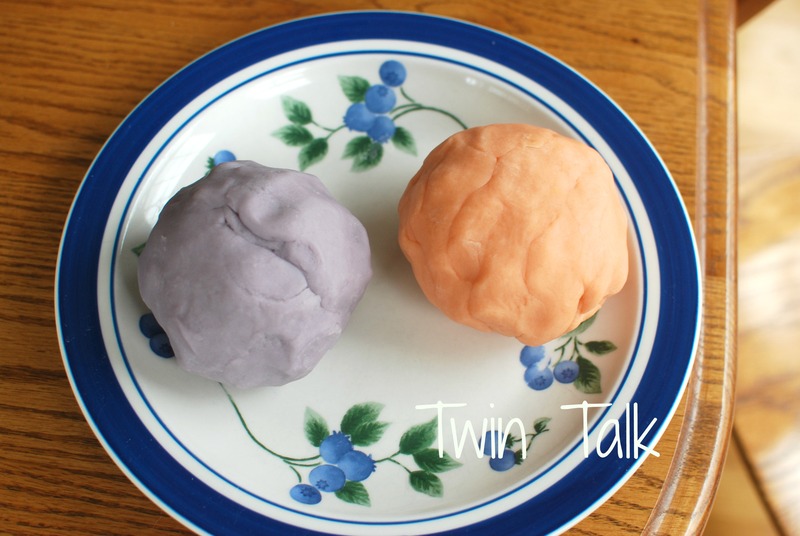 Ohh, I haven’t done playdough yet for my boy,but I’ve been thinking about it!! Now I must really get it done! I’ve not seen this recipe. The one I have (and my mom used for years and years) has cream of tartar. Vinegar will be so much easier to get/find in Finland. I’m going to make this today, after work, with my boy! Thanks for the nudge. I just came across a sensory project I did with my boy a while ago: contact paper taped to the wall/table (sticky side out/up) and pieces of string (or other stuff, paper, if you want) to ‘tape’ to it. This one stayed up for some time and we had lots of fun. Thanks so much! I love the contact paper idea – I can’t wait to try it out! Thanks for the great idea!! I call an activity successful if it entertains them for a while. I haven’t tried anything like that with my two. 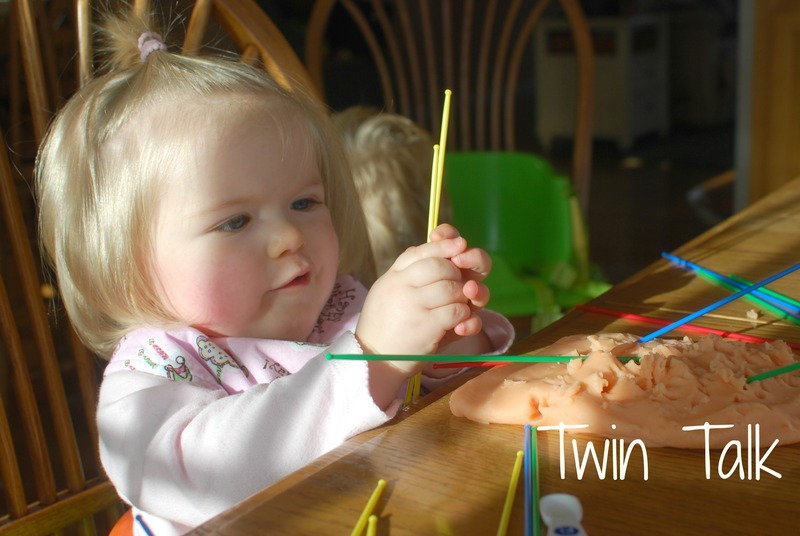 I’m glad you’re still finding time to play with your littles and even blog about it. Love hearing about your blond-haired cuties! Amen – yes, if they’re happy and quiet, then I guess all is well. Thank you so much! With these ingredients you could potentially just make some bread dough, let it rise a little, and then have the kids play with it for a while … then bake it! I make challah almost every week and I have the kids help me shape it, we spend about 20min a week shaping the dough. They also help me knead it before we set it up to rise (I tell them the challah is taking a nap!). They also like to eat the challah they made .. though it wasn’t until recently that they understood that the weird balls that came out of the oven were the challah balls they had made earlier in the day. I love this!! What an awesome idea. Do you have a recipe? I’d love to make it!